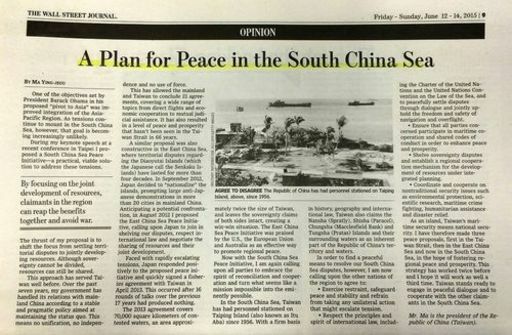 Taipei, June 12 (CNA) The U.S. Wall Street Journal published an article written by President Ma Ying-jeou on June 11 (Easter Time) about his South China Sea Peace Initiative, addressing him as the president of the Republic of China (Taiwan). Ma reiterated that the proposal is a "practical" and "visible" solution to addressing tensions in the region and urged all claimants to shift their focus from settling territorial disputes to jointly developing resources. "Although sovereignty cannot be divided, resources can still be shared," the president wrote, expressing Taiwan's hope to engage in "peaceful dialogue and to cooperate with the other claimants in the South China Sea." One of the objectives set by President Barack Obama in his proposed "pivot to Asia" was improved integration of the Asia Pacific Region. As tensions continue to mount in the South China Sea, however, that goal is becoming increasingly unlikely. During my keynote speech at a recent conference in Taipei I proposed a South China Sea Peace Initiative -- a practical, viable solution to address these tensions. The thrust of my proposal is to shift the focus from settling territorial disputes to jointly developing resources. Although sovereignty cannot be divided, resources can still be shared. This approach has served Taiwan well before. Over the past seven years, my government has handled its relations with mainland China according to a stable and pragmatic policy aimed at maintaining the status quo. This means no unification, no independence and no use of force. This has allowed the mainland and Taiwan to conclude 21 agreements, covering a wide range of topics from direct flights and economic cooperation to mutual judicial assistance. It has also resulted in a level of peace and prosperity that hasn't been seen in the Taiwan Strait in 66 years. A similar proposal was also constructive in the East China Sea, where territorial disputes regarding the Diaoyutai Islands (which the Japanese call the Senkaku Islands) have lasted for more than four decades. In September 2012, Japan decided to "nationalize" the islands, prompting large anti-Japanese demonstrations in more than 20 cities in mainland China. Anticipating a potential confrontation, in August 2012 I proposed the East China Sea Peace Initiative, calling upon Japan to join in shelving our disputes, respect international law and negotiate the sharing of resources and their joint development. Faced with rapidly escalating tensions, Japan responded positively to the proposed peace initiative and quickly signed a fisheries agreement with Taiwan in April 2013. This occurred after 16 rounds of talks over the previous 17 years had produced nothing. The 2013 agreement covers 70,000 square kilometers of contested waters, an area approximately twice the size of Taiwan, and leaves the sovereignty claims of both sides intact, creating a win-win situation. The East China Sea Peace Initiative was praised by the U.S., the European Union and Australia as an effective way to promote regional peace. Now with the South China Sea Peace Initiative, I am again calling upon all parties to embrace the spirit of reconciliation and cooperation and turn what seems like a mission impossible into the eminently possible. In the South China Sea, Taiwan has had personnel stationed on Taiping Island (also known as Itu Aba) since 1956. With a firm basis in history, geography and international law, Taiwan also claims the Nansha (Spratly), Shisha (Paracel), Chungsha (Macclesfield Bank) and Tungsha (Pratas) Islands and their surrounding waters as an inherent part of the Republic of China's territory and waters. • Exercise restraint, safeguard peace and stability and refrain from taking any unilateral action that might escalate tension. • Respect the principles and spirit of international law, including the Charter of the United Nations and the United Nations Convention on the Law of the Sea, and to peacefully settle disputes through dialogue and jointly uphold the freedom and safety of navigation and overflight. • Ensure that all parties concerned participate in maritime cooperation and shared codes of conduct in order to enhance peace and prosperity. • Shelve sovereignty disputes and establish a regional cooperation mechanism for the development of resources under integrated planning. • Coordinate and cooperate on nontraditional security issues such as environmental protection, scientific research, maritime crime fighting, humanitarian assistance and disaster relief. As an island, Taiwan's maritime security means national security. I have therefore made three peace proposals, first in the Taiwan Strait, then in the East China Sea and now in the South China Sea, in the hope of fostering regional peace and prosperity. This strategy has worked twice before and I hope it will work as well a third time. Taiwan stands ready to engage in peaceful dialogue and to cooperate with the other claimants in the South China Sea. Mr. Ma is the president of the Republic of China (Taiwan), the paper noted at the end of the article.